8:30AM Good breakfast everyone in good spirits, 915am we load up and cycle slowly into the town Postcards bought and written in the market place. buildings and lorry firms. 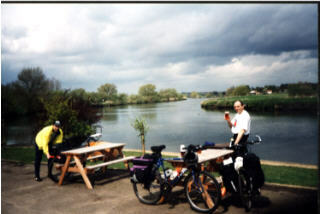 Slowly get back into rural country heading towards Loddon, nr Ellingham a Lady asks if we'd seen a dog funnily enough we had seen one two miles previous running opposite direction 11am ish Loddon very nice place on the broads stopped near the boats, toilet stop ,and photos very pretty place. 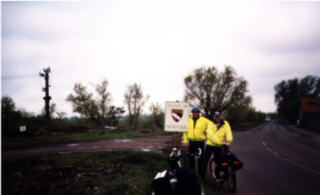 rode through pleasant villages, although we did get a short shower. bottom making our way down to a pretty pub by the river at Woods End. Colin was about 300yards ahead and started circling Graeme and I agreed we were getting him trained at pubs because he doesn't ride past he circles in the road waiting for us to stop. Back appear round the bend. city. We then hit the Marriott's way, the map said it was uneven, it was boggy narrow muddy after a couple of miles we binned out back on the road and just on the outskirts of Norwich we picked out a route taking us to Reepham avoiding the Marriott's way and the mud, lucky we did as the weather also deteriated and we arrived in Reepham approx 4:30pm just as it starting to rain we dived into a cafe for the slowest service in Britain after we ordered food she had to re check every order, brought tea pot and no cups, sausage roll no fork it was slow progress. 5pm rain easing, back on advised road route. 5:10pm we realise we need to be at Bintree approx 5mls away before the post office closed for our accreditation. 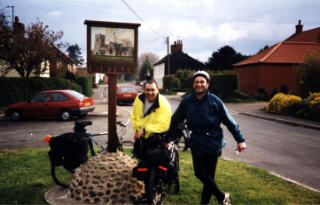 Graeme collects our stamps and off he goes.Colin and me keep plodding, we cycle on into a village which I think is Bintree when in fact it was Foulsham, we cycle down to the post office no Graeme I start chuntering about splitting up wondering about where he can be, notice post office closed, then realise we are in the wrong village. Bintree one mile. Colin then en route requires the toilet urgently. We get to Bintree Graeme has been successful, the sun is shining and everything has worked out, Only Colin desperately needs the loo. Shall we go for a drink in the pub for a drink he says, that's a first for Colin we didn't wish to disappoint him we get the drinks he dives for the loo. 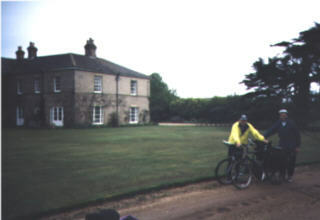 a very welcoming lady Elizabeth, a well spoken lady, who couldn't be more helpful she showed us the garage for our bikes and the house and the rooms all for £20 a night amazing. We had the place to ourselves although Graeme told me that Colin in all these posh surroundings started scrubbing his panniers in the bath. Just when we thought it couldn't get any better the lady of the house informed she would drive us to the pub and better still collect us amazing service.